For those interested in our resource list, I’ve decided to put it all together in a blog post. Some of it seems redundant, but there are little things that are unique to each one and some are just easier to read than others. 2011 – A computational approach to candidate gene prioritization for X-linked mental retardation using annotation-based binary filtering and motif-based linear discriminatory analysis. 2015 – ZC4H2, an XLID gene, is required for the generation of a specific subset of CNS interneurons. As the article 19 Examples of Ability Privilege from Everyday Feminism points out, it is a good thing to be aware of one’s privilege and appreciate it. This awareness can help create compassion toward the needs of others. We can all be a little more patient with those whose needs exceed our own and help create equal opportunity where it may be lacking. 8) try not to look too upset when you see other puppies playing with toys and playground equipment that is meant for typically-developing puppies. 14) love your puppy more than you can say because she is more than worth all the effort. We try to have a good sense of humor, especially about things that can be hard to deal with. I don’t expect anybody to go out and adopt a disabled puppy to see things through our eyes. But if you did I’m sure you would get the best cuddles ever, just like we do, because words aren’t always required to say “I love you”. I’m sitting here with my coffee, trying to wake up after a night of not sleeping well. Five tabs of medical publications and one tab for “dictionary.com”. This morning, I’m working on several different writing projects, the most difficult being the simplified-language medical research paper I’ve been pondering for several weeks, the easiest being Melora’s intro letter to the preschool teachers and therapists for this school year. And there’s this blog post, obviously! We never wanted to be medical researchers. As children, “advocate” was never on our lists of future careers (not that it’s actually a paid career!) Yet, poring over medical journals and understanding terminology we’d never seen before is becoming the new normal. Learning the science of genetics, neurodevelopment, and futuristic medical treatments is what we do now. Our cause is “cutting-edge” and “groundbreaking”, terms we used to be impressed by, but are now disappointed by. It would be so much more comforting to just be able to get all the info and support we need from the nurse at the doctor’s office. But, when all you can find is techno-babble and you know there must be others like you, there is no choice but to “trail-blaze”. Our search for families of people diagnosed with Wieacker-Wolff Syndrome has taken us from the United States to Europe. This being the case, we are considering learning languages other than the one we already know. That is, in addition to the languages of genetic medicine, internet navigation, data compilation/distribution, advocacy, corporate communication, blog-writing, etc etc, I could go on for days. In becoming accidental researchers, we’ve learned a few things. For one, medical providers are great (usually. Ours have all been pretty great, anyway), but they don’t know everything. With Melora, we have to be prepared to share our knowledge with them. All patients should try to be knowledgeable about their own health. Any good provider will want to be as informed as possible and will want to know everything they can about your medical condition. Although it is a bit unexpected to have a healthcare professional say they’ve never heard of your illness, it is reassuring when they admit it and ask for more info. There’s nothing like a specialist telling you, “I have more studying to do”! In addition to our evolving relationships with doctors, we’ve learned that even though there are 7,000 different diseases that are classified as rare, all the people with rare disease have certain things in common. They, and their families and caregivers, must become experts on their condition. They will likely become researchers themselves and develop a sense of community in their support groups. Even in a single rare disease, any two people with the same diagnosis can have similarities that define their situation, but also differences that make their experience unique. Furthermore, gathering, compiling, and providing data to the public in a reader-friendly manner is a job that is quite underrated. Non-fiction and technical writing require educating oneself on the subject, and related topics, completely. Between that and the actual writing, it’s a lot of work! In the long run, we’re glad for the technology available to us that makes all our research possible. We value the opportunity to share what we learn. We appreciate the futuristic devices that will make our child’s life easier as she gets older and the possibility that scientific advances could greatly improve her outcomes. Then there’s the increasing public acceptance of individuals with differences and disabilities. Enlightenment and compassion are what drive us to unearth and disseminate every tiny piece of attainable data. The more we, as parents, know, the better our child’s quality of life. And if we can assist others by sharing, well, that’s a pretty fantastic bonus. There are a lot of things Melora can’t do on her own. She can’t walk or even put weight on her feet. She can’t crawl or even get to a hands-and-knees position. She can’t roll around to get to a toy she wants. Melora has autistic behavior. She can’t communicate with words. She can’t make consistent eye contact. It can be a lot of work to make her smile or even laugh. Melora is a sweet little girl who loves her family. She can cuddle better than most people. She loves to laugh when people dance or act silly for her. She can work very hard practicing with communication devices to make herself understood. Melora loves life and reminds us to live in the moment. She can appreciate the beauty of the trees when we take her for walks on the trails. She can enjoy her foods and try news ones quite willingly. Melora is enthusiastic about movement. She can rock on her rocking horse and go really fast. In the pool, she can have a blast floating, splashing, kicking. She can view the world in a different way when we hold her upside-down. There are a lot of essential things Melora can’t do, which causes us to worry about her future. But there are a lot of very important things she CAN do. She can make strangers smile uncontrollably as they walk by. She can keep us on our toes and prevent us getting stuck in a routine. She can make us laugh with her adorable sneeze and baby-doll expression. When you do the math, the things Melora can do tower over the things she can’t. Of course, the hardest thing is to not hear her words, but we know they’re there. We just need to learn her language. And we’re getting there. One day at a time, one hour at a time, sometimes one minute at a time. Melora was born in 2011. She spent two weeks in the NICU because she had a lot of trouble feeding and her ability to breathe on her own was questionable. She was evaluated by an orthopedic surgeon and a geneticist for “multiple dysmorphic features”; she has mild joint contractures in her hands and feet (distal arthrogryposis) and limited flexibility in her knees and hips. After she came home, we started early intervention services. She’s been in occupational, speech, and physical therapies since she was 4 months old. 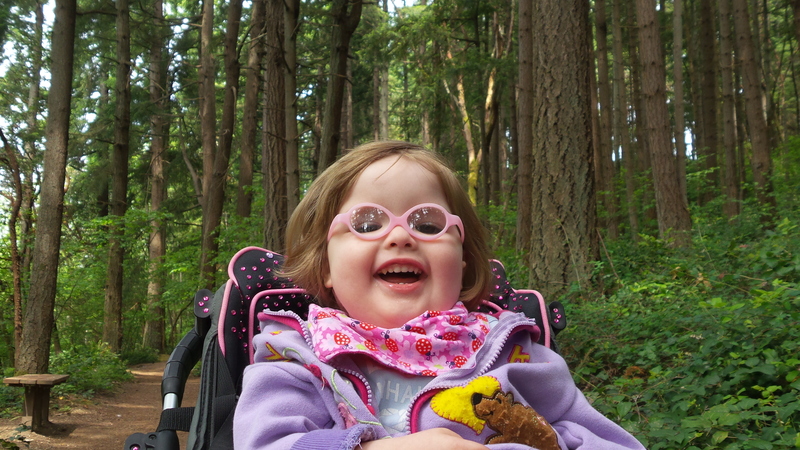 Melora has always had a lot of muscle weakness (hypotonia), causing delays in her physical development. Her small muscles are also affected, causing eye-muscle weakness (for which she wears glasses) and feeding difficulties (we have to choose her foods carefully so she doesn’t choke on them). Her level of intellectual disability is hard to determine due to apraxia of speech (she can’t talk). We’ve been seeing her geneticist since she was born, trying to find the cause of her difficulties and differences. After previous testing failed to provide answers, we got a whole exome sequencing and found (after almost four years) that Melora has a mutation in the gene “ZC4H2” (XQ11.1). Mutations in this gene are the cause of Wieacker-Wolff Syndrome (aka Wieacker Syndrome or WWS). Simply put, ZC4H2 helps with nervous system development and the creation of neurolomuscular connections. In other words, Melora’s brain has trouble telling her body what to do. And her joint contractures were caused by minimal prenatal movement (she got stuck because she couldn’t move). While Melora’s specific mutation hasn’t been seen before, WWS is itself almost as rare. With “fewer than 30 affected individuals” (Orpha.net), it would be impossible for us to come up with a prognosis. Her future is very uncertain. Her neurologist says she will likely start having seizures at some point, but there’s no way to know how soon. We don’t know whether she’ll get better or worse since we currently have no others to compare her to. We hope, with this page, to find others like her and raise awareness for rare disease in general. And maybe if treatments or a cure are found for another rare disease, it could possibly help Melora.